On Wednesday we slept in a bit. After I got out of the shower, Ryan suggested we go and get donuts from a popular local donut shop. While Dave was getting up, Ryan and I took Emma for a little ride to pick up the donuts. They were quite good – not too heavy, and very flavorful. While Dave, Ryan, and I ate breakfast, we tried to figure out what to do for the day. I was advocating visiting some kind of caverns, knowing that it would be warm and humid and probably a little miserable to do any kind of outdoor activity. 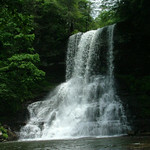 Ryan had recently taken his parents on a hike called the Cascades, in Jefferson National Forest nearby. Dave thought that sounded like a good choice. I poked around for a while, still researching the cavern idea. It turned out that the nearest good caverns (Luray Caverns) were two and a half hours away. So we were definitely set to do the Cascades hike. As it turned out, this was the perfect choice. It was a bit hot and humid, but the path was heavily wooded and shady, and the trail was near the creek the entire way up. 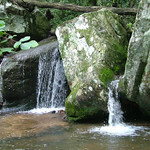 It was 2 miles up the Lower Trail to the main waterfall, then 2 miles back down a much faster Upper Trail. When we got to the top we rested for a while and enjoyed watching the waterfall (I really wish I had worn my bathing suit to go swimming in the pool at the bottom of the fall) and took a photo, then headed back down the trail. We headed back to Blacksburg and had lunch at a little Greek diner called Souvlaki. It was very yummy. Then Ryan went to campus for a while to sit in on a seminar, while Dave and I went back to the house to rest and do some laundry. Once Elyn got home we had dinner, and then we went out in Blacksburg. We stopped by one of the town’s two music stores to browse for a while, then went to a bar and had a couple of drinks and watched some baseball. We didn’t stay out too late… we got home and watched “The Daily Show” that Ryan had Tivo’d, and then went to bed.